“Oh, this is the night, it’s a beautiful night And we call it bella notte Look at the skies, they have stars in their eyes On this lovely bella notte Side by side with your loved one You’ll find enchantment here The night will weave its magic spell When the one you love is near For this is the night And the heavens are right On this lovely bella notte This is the night It’s a beautiful night And we call it bella notte Look at the skies They have stars in their eyes On this lovely bella notte Side by side with your loved one You’ll find enchantment here The night will weave its magic spell When the one you love is near For this is the night And the heavens are right On this lovely bella notte” – Bella Notte, Originally sung by George Givot as the voice of Tony the Chef, Bill Thompson as the voice of Joe the Assistant, and the Disney Chorus, Composed by Oliver Wallace, Lyrics by Peggy Lee and Sonny Burke, From the Disney animated film Lady and The Tramp released on June 22, 1955 This piece of Robike fanart, which is an art trade I have accomplished with my dear friend KatyGorl, is dedicated to the amazing Pongpang aka the-pongpang-art who celebrated her birthday a week ago and Ika-chan aka LoveEmerald, Cinnamon aka Cinnamon-Swirls, and Miluda aka blameshiori who are celebrating their birthdays today. So, Pongpang, Ika, Cinnamon, Miluda, I wish you lovely ladies joy, prosperity, beauty, strength, glory, and love in everything you do as artists and as people. Keep on making wonderful pieces of work and stay awesome, blessed, and full of abundance. This is also dedicated to all of the wonderful Mike x Robin or Robike shippers out there. So, I hope you all enjoy this lovely piece of Robike fanart. 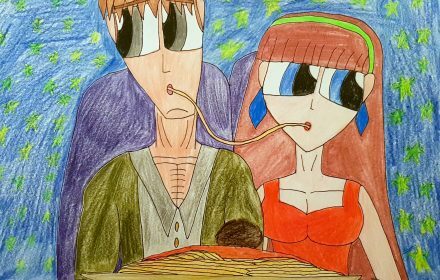 Here we have Mike Believe and his darling wife Robin Snyder-Believe having a lovely date in a cozy Italian restaurant where they are a dinner consisting of spaghetti topped with a giant meatball seasoned and cooked to perfection, loaded with marinara sauce, and sprinkled with basil leaf bits and bits of parmesan cheese that has already been melted. Plus, this adorable normie couple from Townsville even have a Lady and The Tramp moment where they are even re-enacting the classic spaghetti kiss scene, which in turn is my inspiration for this little date scenario between Mike and Robin. Speaking of Disney’s Lady and the Tramp, it should come off as no surprise that Bella Notte has been one of my most favorite songs ever since I was a toddler. So, when combining my favorite song from one of my favorite animated Disney movies from the 1950’s with one of my most beloved Powerpuff Girls OTPs of all time, I thought to myself this is absolute genius. This classic song, as well as the iconic scene between The Tramp and Lady which emits so much nostalgia, is the perfect match for the scenario Mike and Robin are in. Without further ado, I present you not just one, not just two, but four versions of Bella Notte. The first is the original version sung by George Givot, Bill Thompson, and the Disney Chorus, the second one is the 1955 Italian version, the third is the pop version with Carlos Ponce and Joy Enriquez, and the fourth one is the Glee version sung by Chord Overstreet as Sam Evans, Kevin McHale as Artie Abrams, Harry Shum Jr. as Mike Chang, and the late Mark Salling as Noah Puckerman. I hope you also enjoy listening to these four selections as you gaze into the loveliness that is Mike and Robin on a date, and tell me in the comments which version you prefer the most. The original version sung by George Givot, Bill Thompson, and the Disney Chorus The 1955 Italian version The 2001 pop version with Carlos Ponce and Joy Enriquez The 2011 Glee version with Chord Overstreet, Kevin McHale, Harry Shum Jr., and Mark Salling I hope you all enjoyed this piece of Robike goodness and I will see you all in the next submission. Mike Believe and Robin Snyder from The Powerpuff Girls belong to Craig McCracken and Cartoon Network. “Le ciel bleu sur nous peut s’effondrer Et la terre peut bien s’écrouler, Peu m’importe si tu m’aimes, Je me fous du monde entier. Tant que l’amour inondera mes matins, Tant que mon corps frémira sous tes mains, Peu m’importent les problèmes, Mon amour puisque tu m’aimes. J’irais jusqu’au bout du monde, Je me ferais teindre en blonde, Si tu me le demandais. J’irais décrocher la lune, J’irais voler la fortune, Si tu me le demandais. Je renierais ma patrie, Je renierais mes amis, Si tu me le demandais. On peut bien rire de moi, Je ferais n’importe quoi Si tu me le demandais. Si un jour la vie t’arrache à moi, Si tu meurs que tu sois loin de moi, Peu m’importe si tu m’aimes Car moi je mourrai aussi. Nous aurons pour nous l’éternité, Dans le bleu de toute l’immensité. Dans le ciel, plus de problèmes. Mon amour crois-tu qu’on s’aime ? Dieu réunit ceux qui s’aiment.” -Hymne à L’Amour, Edith Piaf, Music by Marguerite Monnot, First Performed at the Cabaret Versaille on September 28, 1949, First Recorded on May 2, 1950 English Translation: “The blue sky onto us can collapse and the earth can fall down It doesn’t matter if you love me I don’t care about the whole world. As long as love floods my mornings As long as my body trembles under your hands I don’t mind the problems My love, since you love me I’d go to the world’s edge I’d dye my hair blond If you asked me I’d take down the moon I’d steal wealth If you asked me I’d abnegate my homeland I’d abnegate my friends If you asked me I can be laughed off I’d do anything If you asked me If one day, life tears you away from me if you die, being away from me It doesn’t matter if you love me Because I’d die as well. We’d own eternity Within the blue of whole hugeness In the sky, no problem anymore My love do you believe we love each other? God brings together those who love one another.” This piece of Robike fanart, which is part of my dearest friend’s Kaitlyn’s aka KatyGorl’s Claim a PPG Pairing Month, is dedicated to the ever fabulous, ever wonderful KatyGorl and the magnificent and astounding Lynn aka NanakoBlaze who are celebrating their birthdays today. So, Kaitlyn, Lynn, I wish you lovely young ladies a most pleasant, wonderful, joyous, grand, and prosperous birthday. You are amazing artists and people and I bless the both of you in everything you do. Comme on dit en francais, je vous souhaite un anniversaire plus agréable, merveilleux, joyeux, grand et prospère. Vous etes artistes et personnages trés magnifiques et je vous deux bénis dans tout vous faites. I would also love to dedicate this to all of the wonderful Robike shippers out there. Asseyez-vous, relaxez et prenez plaisir, mes cheres amis et camarades de le shipping de Mike Believe x Robin Snyder ou Robike. It should be no surprise that out of all of the Powerpuff Girls-related pairings that I have been a most loyal Mike Believe x Robin Snyder or Robike shipper and fan when I was fifteen years old. I was pleasantly surprised when I first saw this pairing on DeviantArt and I was wonderfully amazed by the works involving these two darlings as a couple. Now, as an adult of twenty-six years old, this pairing holds up wonderfully to this very day. I would even go out of my way to say that Robike has held up much better than Boomubbles and is even on par with my most favorite RRB/PPG pairing of all time, which is truly saying something. So, Mesdames et Messieurs, here we have Mike Believe and Robin Snyder-Believe being the absolutely adorable lovebirds that they are. 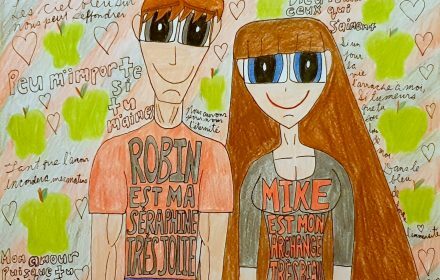 For those of you who do not understand French or are neither Francophiles nor Francophones in the slightest, Mike’s shirt is loosely translated as “Robin is my very blissful seraph”, while Robin’s shirt is translated as “Mike is my very handsome archangel”. C’est l’amour vrai entre les deux ames gentiles et douces. That’s French for, this is true love between two gentle and sweet souls. Moreover, if you could not already tell, Mike and Robin are happily married with three children in my Team Xtreme headcanon and they function as their closest friends and allies in everything the likes of Brick, Butch, Mitch, Boomer, Blossom, Buttercup, Bubbles, and Bunny are doing as Townsville’s and Citysville’s finest superheroes of all time. Given that I am a veteran Robike shipper, I figured that the Édith Piaf classic Hymne á L’Amour would be an excellent choice for this exceptional couple. I can never ever go wrong with the original Madame Édith Piaf version, but I also love Josh Groban’s calmer more reflective version of the song. So, Kaitlyn, Lynn, and all of you exceptional Robike shippers, you are all in for a treat. You get to listen to two versions of Hymne á L’Amour and I would love to know in the comments below which of these two you prefer. Je vous souhaite une bonne écoute, chers amis. Édith Piaf Josh Groban I hope you all enjoyed this and as we say in French, a tout a l’heure, mes amis. Mike Believe and Robin Snyder from The Powerpuff Girls belong to Craig McCracken and Cartoon Network.